As I started writing this, it was as though my son sensed he was blog fodder. He started a battle with the couch that he just could not win. Yesterday he got the stitches out. His first two. I say that knowing it will very likely not be the last, but rather the first of many similar ‘battles’. This little guy is one going on ten. I swear he doesn’t know he hasn’t been here long. He will climb on anything, reach for anything, and peer into anything. 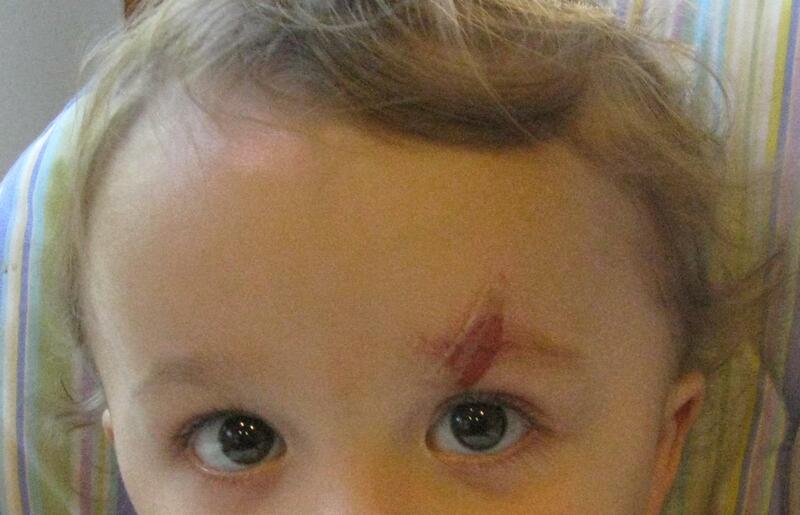 So far he has fallen head first off a trampoline, pinched his fingers in doors, hung off of the ‘safety’ gates in our house, stopped a fall on concrete with his forehead, and gouged out his eyebrow (the stitches). We got a bench with cubby holes underneath and had to turn it on its side because he was on top of it within seconds and playing with the light switch (his favorite thing, only second to opening and closing doors). Once on its side, he decided it was a place in which to play, and promptly climbed in and out of each cubby until he got stuck straddling one and almost ruined the family jewels. I can just see explaining that one to the doctor. “Well you see doc . . .” Sigh. I have toddler proofed the house the best I can, but he seems to be . . . SuperToddler! Pant, pant, pant . . . I am out of breath just writing this. I shudder daily at what his next ‘adventure’ will be. You know those plastic covers that go on doorknobs? The ones that keep kids from opening doors? He snapped the first one off a door while I was putting the second on another door. He figured out how to close the buckles on the high chairs, and I am holding my breath for the day he figures out how to UN-buckle them. He can’t sit too close to the other two kids while in the chairs, because he knows how to unhook their trays and send them crashing to the floor. And I have to let him out of his chair last, or he will unclip their trays from the underside. While I really want him to have the freedom to run around, it makes me extra nervous when I must help one of the other two and I can’t watch him. Sometimes I have to put him in a bouncer just to have peace of mind while I tie someone else’s shoe or God forbid, go to the bathroom. If I don’t, I will either find him getting onto the shelf above the sofa gunning for the remote, or see his little fingers wiggling under the bathroom door.